Night Shift in iOS causes the device display to readjust to a warmer color spectrum, thereby reducing the displays output of blue light. This makes the screen of an iPhone or iPad not only more pleasant to look at in the evening and dark hours, but it also is easier on the eyes and potentially offers some health benefits as well. 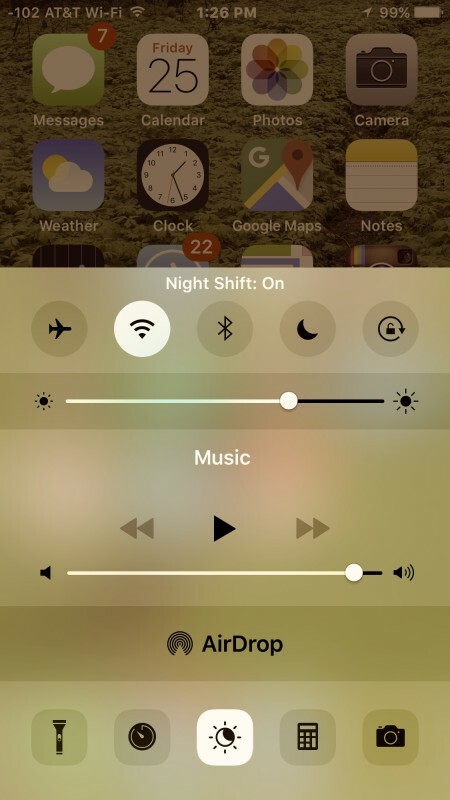 Using Night Shift is extremely easy and you can quickly toggle the feature on and off anytime in iOS, or you can set it on an automatic timer as well to turn itself on with sunset and sunrise. Night Shift requires the latest version of iOS to be installed on the iPhone, iPad, or iPod touch, versions earlier than 9.3 do not have the option available. The effect is immediate and you’ll notice the color instantly shift to become warmer if Night Shift is turned on. If Night Shift was already enabled, turning it off will turn the display back to its default color profile. What Does Night Shift Look Like? The animated gif image below demonstrates what an iPhone display toggling between Night Shift and regular mode looks like, with the Night Shift version being significantly warmer with an orange / sepia brown tone to the whites and screen colors. You can adjust the warmth of Night Shift by going to Settings > Display & Brightness > Night Shift, generally speaking the stronger the warmth set the better the features impacts on blue light reduction are thought to be, though the display will obviously shift its color profile to be quite a bit different from the default option when it’s enabled. What is the Point of Night Shift? There’s a significant amount of science behind the harmful effects of blue light exposure on sleep and health. Aside from the potential health benefits, you’ll likely find it’s just more enjoyable to read and interact with a warmer display setting once the evening rolls around and the ambient lighting is lower. Whether you use Night Shift on the iPhone or iPad manually yourself as night time rolls around, or if you set it up on automatic mode to adjust itself as the day changes, be sure to use and try the feature, it’s really quite nice. Mac users can achieve a similar effect in OS X by getting Flux for Mac, which adjusts the display color in a similar way based on time of day and user settings. If you tend to use your iPhone/iPad before going to sleep I recommend you try night shift – amazingly, I haven’t slept this well in years though the color space takes a bit getting use to. I completely agree, Night Shift on iOS and Flux on Mac are mandatory. Hearing rumors that Flux type native color profiles will come to OS X in 10.12… we’ll see what happens. Flux and Hey Siri are the tentpole features for now. I still use f.lux on all my Macs and PC’s, though. Doesn’t work on my iPhone 5C or original iPad Mini, despite having iOS 9.3.1 installed on both. This works on all devices, it shifts the colors. This is how you enable Night Shift, if it is not working for you it’s because you have Low Power Mode enabled. It seems to me, that Night Shift button should be at the top, not the bottom. The bottom row houses apps, while the top row houses modes: turn on/off bluetooth or do not disturb. No it does not work on all devices with 9.3.1. I don’t have Low Power Mode Enabled. For those of us who don’t buy a new iPhone or iPad each year it would be nice if you checked which phones and pads can use things before you make a blanket statement. Shirley, my rotary phone from 1975 doesn’t have Night Shift, why is Apple not bringing this feature to my rotary dialer?!? I can’t get it. Night Shift works on virtually every iPhone and iPad that supports iOS 9.3.1, there are one or two exceptions. No one I know with an iPhone 5 (I talked to I think 6 total) has this feature. This intel is clearly wrong. I also have a 5c and have no option for night shift. Note for people using f.lux on El Capitan (10.11): The new version of “Automatically adjust brightness” in El Capitan seems to cause flickering with f.lux. For the moment, you’ll have to turn this feature off to use f.lux. To make the fix, use System Preferences > Displays and uncheck. Occasionally, a reboot may also be necessary. I use Flux in El Capitan every day without any issue. Night Shift coming to native Mac OS X is the rumor, I hear. The issue is described by the developer, clearly it exists if they acknowledge it, and rumors are just that. I use Flux every night on my Mac with OS X 10.11.4, what is your issue? Works fine, never have a problem with Flux on Mac at all. I use Night Shift on my iPhone every day now too, but I wish it worked with battery saving mode. And why does it have a weird name? Big fan of Night Shift color change. Not a fan of calling it named as Night Shift, talking to people about it makes them think all sorts of things!! “Note for people using f.lux on El Capitan (10.11): The new version of “Automatically adjust brightness” in El Capitan seems to cause flickering with f.lux. 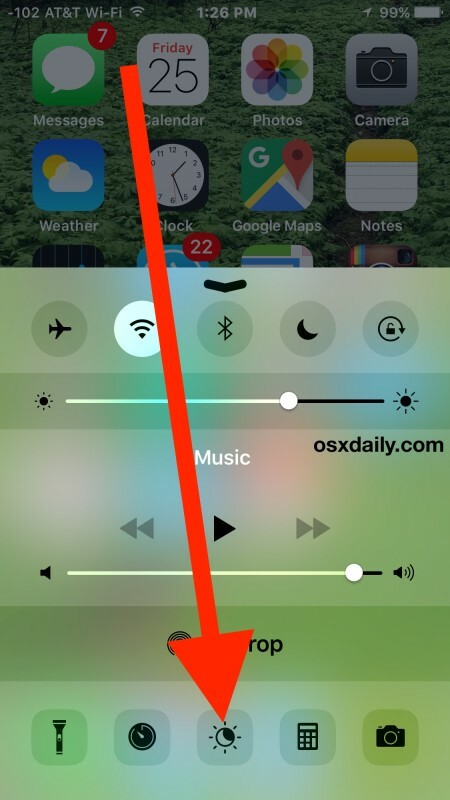 For the moment, you’ll have to turn this feature off to use f.lux. Night shift does NOT work on all 9.3 compatible devices. Folks with iPhones 5s 5c 4 and earlier will not be able to take advantage of this feature. Nor will certain iPad users. If you are willing to jailbreak you can install flux which has this functionality. It’s true those of us who don’t buy the latest new toys year by year miss out on some bells and whistles. OTOH we keep a few (hundred) extra bucks in our pockets.